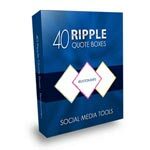 With delivery of this social media package, you get a variety of colorful ripple quote boxes with 20 relationship quotes, measuring 511 x 511 pixels for Facebook and the same quotes measuring 600 x 600 pixels for Pinterest. Since you get the delivery of the blank quote boxes in addition to the quotes, you can reuse the backgrounds as often as you want. 20 – Relationship quotes delivered in TEXT format. 20 – PNG Facebook backgrounds with blank white foreground. 20 – PNG Pinterest backgrounds with blank white foreground. 20 – Web-Ready-PNG Facebook backgrounds with relationship quotes. 20 – Web-Ready-PNG Pinterest backgrounds with relationship quotes. Reuse the blank quote backgrounds to share a variety of social media tips. Even though this package offers (20) quotes for Faceboook and (20) for Pinterest, you can use the blank backgrounds over again for any type of social media marketing that you need. 1 – Powerpoint Layout: Blank Facebook Ripple Backgrounds. 1 – Powerpoint Layout: Blank Pinterest Ripple Backgrounds. 1 – Powerpoint Layout: Facebook Ripple Quotes. 1 – Powerpoint Layout: Pinterest Ripple Quotes.